The purpose built 39 ft Day boat ‘Dancing Duck’ was built at Tooley’s in 2007 and side launched into the canal on the 7th July 2007, the first time that a boat has been side way launched for 90 years. Dancing Duck is 39ft long 7ft wide and Semi traditional style so passengers can sit with the helmsman .The Front cockpit which can be fully enclosed with a canopy.Faculties inside include 2 ring hob, cool box, toilet, Shower, sink and central heating. Sleeps 2 Plus 2 more on camp beds crockery and cutlery. You can come on one of our scheduled trips with other people or hire the boat yourself for a private skippered trip. Self Drive Hire You can hire the boat for up to 6 people for self drive. Persons holding an ‘RYA inland Waterways Certificate’ can hire the boat for up to 12 people. RYA inland Waterways Certificate’ courses are available at Tooley’s Boatyard. 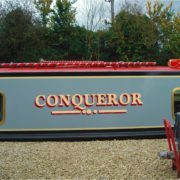 ‘Conqueror’ has now joined ‘Chieftain’ at Twyford Wharf Narrow Boats. After some 70 miles and 120 locks – 4 days only – the crew celebrated with a couple of beers!! Both boats are identical and support the same livery. ‘Conqueror’ is now hired form Easter through to end of September. Chieftain narrow boat cruises at Christmas! Firstly a very Happy New Year to you both – we hope you enjoyed seeing in the New Year in style, with family and friends! Having recovered from our own New Year celebrations and having survived our first week back at work, we wanted to write to say a huge thank you to you both for all you did to make our time on board Chieftain narrow boat so comfortable. We had such a lovely time helped enormously by the comfort that we experienced on board – one thing for sure it wasn’t the weather that contributed to our comfort!! Although Joe has been on a narrow boat before, I never have, so to book your boat during the Christmas period was, to say the least a risk! I was always very excited and keen to “have a go” and the idea of getting up on deck, cruising in the winter sunshine, possibly even snow, soaking up the fresh air and meeting other people on the canals was appealing to me. What we didn’t anticipate was the amount of rain, the high winds and the serious floods that hit the Oxford Canal. However, we were never fazed by this. Chieftain narrow boat was so comfortable and fitted out to provide us with all the amenities that we are used to at home. The two double beds in particular were so comfortable and with radiator central heating on board, we were never cold. The galley kitchen provided us with the equipment to cook a good meal on board, although we decided not to attempt a full Christmas Dinner! 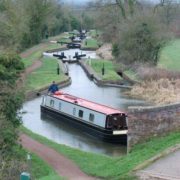 Cruising the Oxford Canal on the narrow boat was truly amazing – the sense of freedom and the joy of meeting so many interesting people along the route was brilliant and has provided us with an enormous amount of memories to treasure. It’s a holiday for all ages; we had Mum and Dad on board who are going to turn 80 next year, Joe, who did most of the ‘driving’ is nearly 70 and then there was me, whose age shall remain a secret but certainly a lot younger! Just as well, because my job was opening the locks!! After the first couple, this became second nature and easily possible for fit healthy people. It’s a great holiday for all ages, at any time of the year. We had some of the worst rain this year but it didn’t stop us – it only gave us more determination to cruise again in the Spring when hopefully the weather will be much better. Once again, we can’t thank you enough for the “extra” help you gave us – your hospitality and flexible attitude certainly helped to make our holiday such a memorable one. https://www.narrowboatholidays.com/wp-content/uploads/2014/02/logo-retina1-1.png 0 0 Colin & Louise https://www.narrowboatholidays.com/wp-content/uploads/2014/02/logo-retina1-1.png Colin & Louise2013-01-09 21:24:162013-01-09 21:24:16Chieftain narrow boat cruises at Christmas! 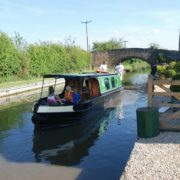 After being fully booked all through last year I know that many potential customers were disappointed that we did not have another narrow boat for hire. After all, The Oxford Canal is one of the nicest in Britain to cruise! 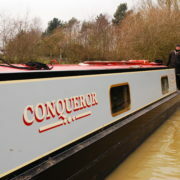 So for the 2013 season ‘Conqueror‘ has joined ‘Chieftain‘. Both narrow boats are identical and each will sleep up to 6 persons. There are two bedrooms – each with a double (rear converts to two singles if preferred) each with their own facilities – ensuite. The dinette converts to a further double if required. This makes for very comfortable cruising if there are 4 adults or a family of four. Conqueror will be finished in the same livery as Chieftain, which proved so very popular with everyone. General comments being, ‘Wow, we had so many compliments re the boat and nobody thought we were a ‘hire’ boat!’ A special thank you to all those that cruised with us last year for looking after Chieftain so well and to those of you who have already booked for 2013. All that remains now is to put behind the rainy summer of 2012 and look forward to a sunny 2013. 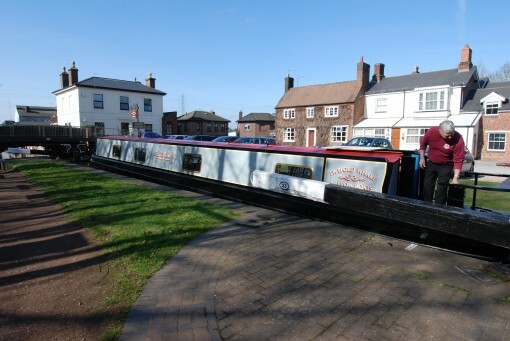 Celebrating the Jubilee weekend with a narrow boat holiday! Chieftain sails from The Old Barn with 3 young happy cruisers on their half-term weeks Narrow boat holiday. Alice, Ruby and Nathan can’t wait to celebrate and enjoy any festivities along the Oxford canal. Just come back from a glorious week on Chieftain narrow boat, on the Oxford Canal. Have to say that my wife and I loved the narrow boat. It drives beautifully, it’s cosy and cute inside and it looks pretty gorgeous with it’s “non-hire-boat” colour scheme. We got a lot of admiring comments from people who thought it was our own narrow boat. All in all – I can’t praise Colin, Brian and Louise enough – they even arranged for perfect sunshine throughout the week. ps. and they’re not even paying me to be so nice – I’m just saying it because it’s true! Narrow boat holiday – We’re here to help! Tell us all about your Narrow boat holiday! This Saturday saw Chieftain set sail on her maiden cruise. (Doubt she will meet any icebergs on the Oxford Canal though!) Not the best week with a lot of rain forecast but with the central heating, it is nice and cozy on-board. We would like you to send us those memorable narrow boat holiday ‘snaps’ for our blog and write some experiences of your holiday. https://www.narrowboatholidays.com/wp-content/uploads/2014/02/logo-retina1-1.png 0 0 Colin & Louise https://www.narrowboatholidays.com/wp-content/uploads/2014/02/logo-retina1-1.png Colin & Louise2012-04-09 13:37:472018-03-07 13:48:33Narrow boat holiday - We're here to help! Hi all, well we have just completed 77 miles and 147 locks bringing ‘Chieftain’ canal boat back to the ‘Old Barn’ from Stoke Prior. 4 fantastic days with great March sun and temperatures up in the 18 degree region. Along the way we saw the March hares, March lambs and almost had the canal to ourselves – Chieftain is a great cruising canal boat, very comfortable and accommodating. We were up at 6.30 am and motoring by 7 am with breakfast at 9.30, bacon rolls and lots of coffee. Lunch was taken by the side of the canal around 1 pm and we stopped at around 5.30 pm. 2 meals on board and 1 in the local pub. All in all, a great 4 days – strong shoulders and a a little lost around the ‘waist line’!! Well folks – after a long winter Chieftain canal boat sets to the waterways. More photos will be posted as soon as possible. We would just like to say a huge thank you to Colin, Louise and Brian for making our narrow boat holiday easy, fun, relaxing, enjoyable and but most of all comfortable! Booking was quick and simple; we just called and spoke to Louise who was more than happy to answer any questions we had about the narrow boat and what routes we could take in our time scale. She was also able to tell us about what to do and see on the Oxford Canal and connecting routes. We collected the narrow boat and were greeted by Colin and Louise who showed us around the narrow boat and gave us a run through of all the things we needed to know. They are also more than happy to jump on board for the first hour or so to give you demonstration of how to steer and manoeuvre the narrow boat for beginners. The boat had all the things you could need to make it feel like home. There were books and maps telling us about the Oxford Canals and connecting waterways, and points of interest en-route. We had a great two week narrow boat holiday going up the Oxford Canal, onto the Grand Union and completing the Warwick Ring. You work to your own schedule, stopping to admire the scenery and wildlife, or just because you can. We found lots of lovely pubs to stop at for a bite to eat and of course a drink or two!!! Mooring up at night, wherever you want, in the middle of a town, so you can go for a drink and a posh meal, or in the middle of nowhere enjoying the peace and quiet and complete blackness with no street-light pollution. We had great fun on the Hatton Flight and Napton Flight. There are loads of other boaters going up and down so if you are new to it then there are plenty of people help. After opening and closing all the locks you can be guaranteed to get a good night sleep, and toned legs!! If you feel the need to get your land legs back for a short while whilst on the Warwick Ring you can stop off and enjoy a day at Warwick Castle. We had a great day there and it is only a short walk from the free mooring. Stocking up on supplies is no problem either, loads of little local shops or farm shops, where you can get the essentials and much more. We also were able to do a bigger shop at so you will never go without. Once again – thanks to Twyford Wharf Narrow Boats for a great two weeks.